Christiane Matallo began her dance studies at two years of age, with a strong background in classical ballet. In 1993, she graduated from the College of Dance at the Unicamp in Campinas, Brazil and was invited to teach American Tap Dance in Queens, New York. Christiane began her career as an instructor when she was 13 and was awarded for Best Choreography by the National Meeting of Dance – ENDA in Brazil. She most recently became the first tap dancer to be featured in Brazilian Carnival with the group Mocidade Alegra in Sao Paulo which won the annual competition. In 1995, Christiane established her School of Dance known as the Christiane Matallo Studio de DanÇa, offering American tap dance, irish step dancing, jazz, hip hop, classical ballet, contemporary and modern dance. In 1997, she was invited to participate in a Virtual Reality Project for the NICS – Unicamp (Interdisciplinary and Sound Space of Communication) called AtoContAto, based on a new gestual interface. As the researcher, Christiane continues to study new possibilities to express the dance using technological elements. In 1998, Christiane gave her first International Workshop in Bristol – England at the ACM (Association of Computer Machinery). 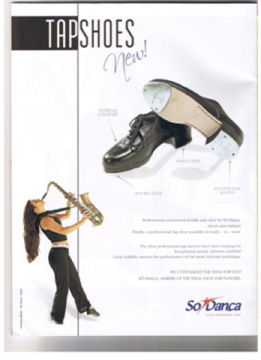 In 1999, she taught Tap dance with an emphasis on Brazilian Rhythms in Vienna, Austria and also presented the work of Virtual Tap, now known as Tap Contact. In 2000, she initiated an artistic social work of American Tap Dance, in partnership with the RAC (Net Anhanguera of Communication) for the “School Project”, a program that cares for about forty underprivileged children in the City of Campinas. The program allows them to study lessons and attend presentations of Tap. In 2001, Christiane taught and performed as a featured artist in the Annual St.Louis Tap Festival under the direction of Robert Reed. As a result of her continued accomplishments in the Art Form of Tap, Christiane appeared on Globo TV several times in addition to several other programs. She also participated as a special guest artist in The New York City Tap Festival and Los Angeles Tap Festival in the US. Christiane’s original style and performance has been highly respected and attended, as her Original show “Da Corda Pro Pe” with Gilberto de Syllos has already been attended by over 100,000 people. The show also showcases her ability to play tenor sax and piano while dancing. Christiane recently founded the first Annual Tap Festival in Sao Paulo, in addition to running the Annual Tap Festival in Campinas, now in its sixth year. She continues to participate in workshops throughout Brazil and festivals worldwide.